Traditional hotel at Lake Reschen with excellent cuisine, inviting wellness area as well as new rooms & suites – ideal for active vacationers, relaxation lovers and gourmets! 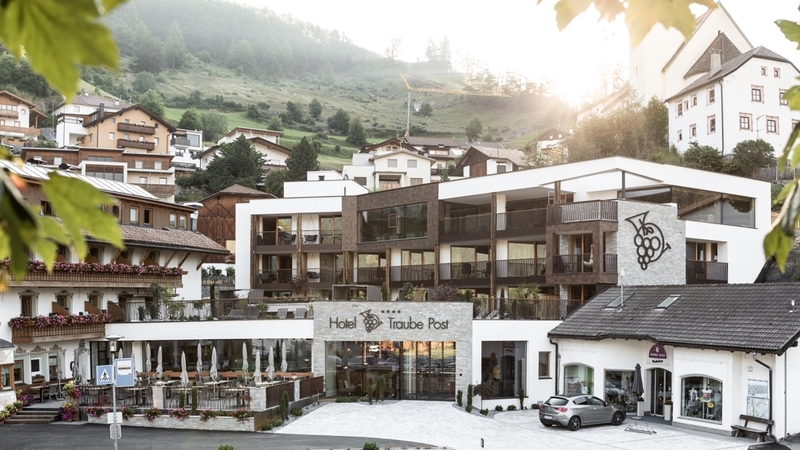 Welcome to the Active & Wellness Hotel Traube Post**** in Graun! 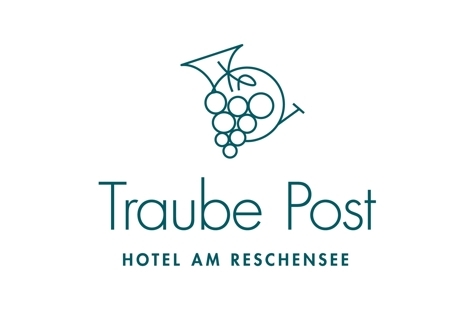 Our Hotel Traube Post**** awaits you directly at the picturesque Lake Reschen with an incomparable lifestyle, precious culture and an impressive past. Discover the holiday pleasures only 300 m from the famous church tower of old Graun. Our guests will look forward to incomparable charms in the middle of the adventurous mountain world of Reschen pass lake plateau. Authentic hospitality and a unique style. In our house, you will find traces of the sunken village Graun everywhere. In the furniture, pictures and in the histories told by the hosts. Distinguished by our multiple awards, our cuisine is recommended by Gault & Millau and characterised by local colourings: From the varied breakfast to delicious 4-course menus at dinner, you will only enjoy healthy and fresh food from the farmers and pastures of the region. For what concerns meat, we give high importance to livestock rearing. Fruit, vegetables and honey are furnished by South Tyrolean producers, who appreciate originality and authentic things just as we do. Connoisseurs look forward to our wine specialities which are personally chosen by chef & sommelier Karl Heinz himself. Our new rooms and suites promise a wonderful living ambiance with appealing colour compositions, a clear design as well as high-quality materials. The panoramic view to the mountains or to the lake is unique too. A highlight for relaxation seekers: our VIVANA Spa introduces you into a world of regeneration, fine essences and exquisite scents. Experience spa pleasures on the highest level in our 1,000 m² wellness area with sauna landscape, exclusive sky whirlpool with view to Lake Reschen and much more. This suite features stone pinewood furnishings for an especially healthful environment and approx. 27 square meters of floorspace. Stone pinewood is known for its positive effect upon sleep and good health. Includes a balcony 11 square meters in size or garden with a view of Lake Reschen / Resia. With spacious bathroom and rain shower, WC, bidet, and hot-air blow dryer as well as boxspring bed, davenport (convertible) couch, writing desk, wellness tote-bag containing cozy bathrobe and slippers, Traube-Post hiking backpack, room safe, satellite TV / radio, telephone, minibar, and free W-Lan. If desired, this room can be accessed by a connecting door to the adjacent "Valbel" Stone Pinewood Suite. Like in our "Valeta" stone pinewood suite, here, too, you'll find stylish stone pinewood furnishings that fill this approx. 36-square-meter suite with revitalizing scents. Includes 11-square-meter balcony or garden with a view of Lake Reschen / Resia as well as a spacious bathroom with rain shower and hot-air blow dryer. WC and bidet are separate. Also features boxspring bed, davenport (convertible) couch, writing desk, wellness tote-bag containing cozy bathrobe and slippers, Traube-Post hiking backpack, room safe, satellite TV / radio, telephone, minibar, and free W-Lan. If desired, this room can be accessed by a connecting door to the adjacent "Valeta" Stone Pinewood Suite. These rooms are rooms handicap-accessible and thus ideal for persons with limited mobility. A suite with an unmistakable character: Our rustic suite with wood paneling exudes a fascinating alpine flair and features approx. 41 square meters of floorspace. The highlight is the 16-square-meter balcony or garden with a view of Lake Reschen / Resia. With a spacious bathroom with rain shower and hot-air blow dryer. WC and bidet are separate. Also equipped with a boxspring bed, davenport (convertible) couch, writing desk, wellness tote-bag containing cozy bathrobe and slippers, Traube-Post hiking backpack, room safe, satellite TV / radio, telephone, minibar, and free W-Lan. The epitome of coziness. Elegant design and a unique atmosphere. With three single beds in a separate room, its ideal also for families with children or good friends. This suite boasts 48 square meters of floorspace, a cozy corner seating and table arrangement, as well as a 7-square-meter balcony with a view of Lake Reschen / Resia and our local mountain, the "Joggl." Equipped with a spacious bathroom with rain shower and hot-air blow dryer. WC and bidet are separate. Also includes: Boxspring bed, wellness tote-bag containing cozy bathrobe and slippers, Traube-Post hiking backpack, room safe, satellite TV / radio, telephone, minibar, and free W-Lan. Our elegant "Curuna" romantic suite features a large, round cozy bed and luxurious free-standing bathtub for that special flair. With 50 square meters of floorspace including 8 square meters of balcony or garden with a view of Lake Reschen / Resia, this gem of a suite is one of our largest. With a spacious bathroom and rain shower and hot-air blow dryer. Shower and WC are separate from the bidet. Also furnished with davenport (convertible) couch, table, wellness tote-bag containing cozy bathrobe and slippers, Traube-Post hiking backpack, room safe, satellite TV / radio, telephone, minibar, and free W-Lan. Food for people with food allergies, Bike rental, Gratis Skibus, Sunshade, Deckchair, Hiking Guide, Multilingual receptionists by day, Pets allowed, Snow boot dryer, Room service, Bike deposit, Family-friendly, Secured storage spaces for bikes and motorbikes, Baggage storage, Quiet position, above 1000 m a.s.l.